Problem: Create a black and white composition using a variety of marks to demonstrate an understanding of visual rhythm, repetition, and pattern. These compositions will attempt to visualize sounds and uncover the relationships between what you hear and what you see. In your sketchbook, while listening to your favorite piece of music, draw the sounds that you hear. Imagine how the sounds would look if they were lines or shapes and consider how they relate to each other. Do you hear repeated patterns and an overall rhythm? Are some sounds rough or sharp and other smooth and flowing? Compose a minimum 2-paragraph description of the sounds you hear. Describe them in terms of pattern, line, shape, variety. Consider how some sounds repeat to create rhythm. Do any of these observations affect how you understand the meaning of the music or the intention of the composer/songwriter/artist? Create a new blog post called Sound Visualization Mashup: Phase 1. Add a link to the piece of music that you listened to via YouTube, SoundCloud, or similar. Don’t forget to comment on at least 1 other student’s post. Take out a soft pencil #3B and your sketchbook. Rhythmic Line Test 1: Listen to this song: Another One Bites the Dust and draw a line representing its rhythm across your first sheet of paper. Repeat and refine until you get a variety of interesting lines. How would you describe these lines? Rhythmic Line Test 2: Listen to this song: Summertime and draw a line representing its rhythm across your second sheet paper.Repeat and refine until you get a variety of interesting lines. How would you describe these lines? Pattern Squares: Now create at least 12 thumbnails: 6 for Staccato and 6 for Legato. Using your rhythmic line tests as a guide, create 6 pattern squares that represents STACCATO and 6 pattern squares that represents LEGATO. Continue to refine these sketches. Try varying the line weight (thick and thin) and the spacing (tight and wide) between the lines. Let the rhythm of each piece of music dictate the look and feel of your patterns. Refer to class pattern examples for ideas. Once you have created at least 4 strong patterns (2 Staccato and 2 Legato) move on to the next step. 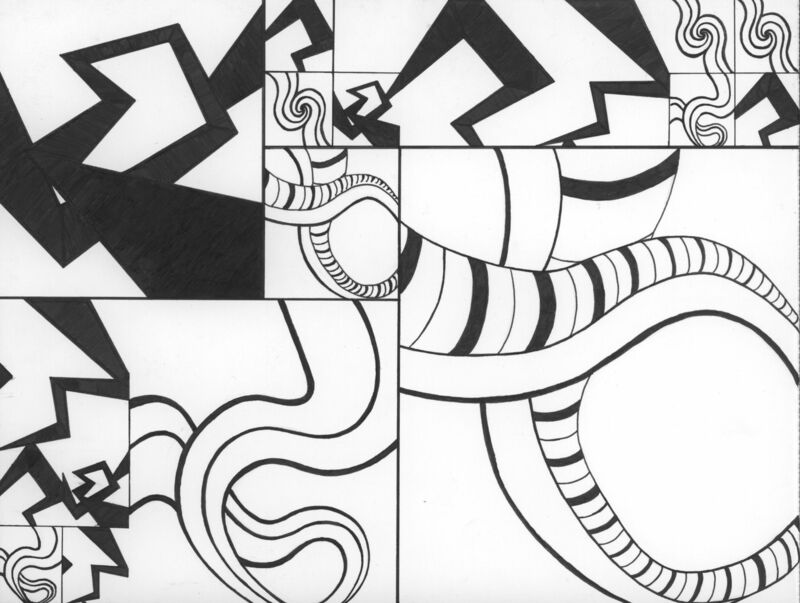 On 9×11″ Bristol create 1 final inked composition using 1-2 Staccato and 1-2 Legato pattern squares. 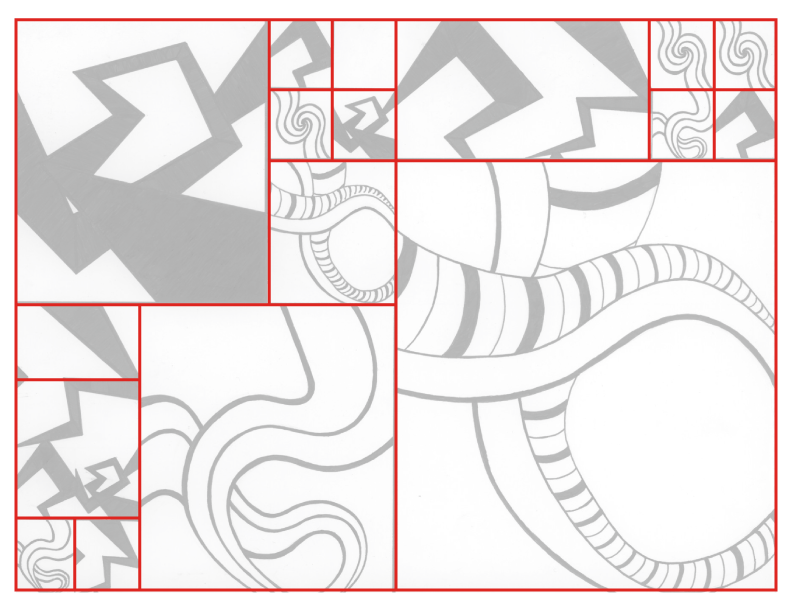 Even though the composition will be a field of pattern, it should feel unified using repetition and variations in scale. You will unite two rhythms (Staccato and Legato), like a DJ mixing parts of different songs or different rhythms. Some squares should be larger, some should be smaller, all pattern squares should repeat at least twice. Create a Layout Grid: Before you begin working, create at least 3 possible layouts in your sketchbook. Think about how you will arrange your different pattern squares on the page. a Grid acts as an invisible or visible structure to support the elements of your composition. a Grid establishes a meter and rhythm. a Grid defines proportion and scale. How will my different staccato and legato patterns relate to each other? When the patterns meet/touch will they complement each other, blend together, or repel each other? What will the overall composition “sound” like? 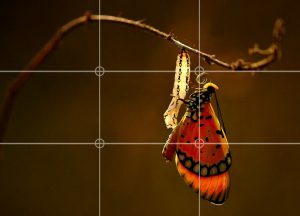 Consider the Rule of Thirds: The rule of thirds works by dividing a composition into thirds, so you end up with 9 equal sections. The areas where the lines intersect are a good place for your main subject or focal point. 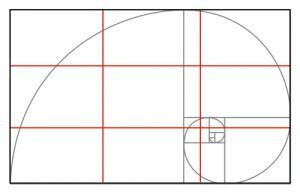 You might also research The Fibonacci Spiral or the Golden Ratio. Using the spiral as a compositional tool helps to direct the viewer in a natural flow. Inking : Once you have decided on a strong layout, draw it lightly on your 9×12″ bristol. Then begin to lightly draw in each pattern squares. Try to keep the pattern squares consistent, only vary the scale and orientation. ie: don’t stretch or crop the individual pattern squares. Once you have laid out the underdrawing, begin inking. Consider this layout from a former student, as an example. Notice how the squares of the grid vary in size and placement on the page. The relationship between the squares on the grid should contribute to the overall rhythm and unity of the composition. Create a new blog post called Sound Visualization Mashup: Phase 2. Don’t forget to comment on at least 1 other student’s posts. Scan your finished inked Pattern Mashup (300dpi, grayscale, jpg). FIND YOUR SCANS HERE! Save this hi-res file as FirstInitalLastNameMashupHIRES.jpg to the folder you just created. Using the rectangle marquee tool, cut (Command + X) and paste in place (Command + Shift + V) each pattern square on a new layer for use in your animation. We will do this together in class. Use this file to experiment with this technique. Open your scan file in Photoshop, rename it FirstInitalLastNameMashupPrep.jpg and save it to the same folder. Save the file FirstInitalLastNameMashup.psd to your project folder. Select All > Copy your FirstInitalLastNameMashupPrep.jpg and Paste into your new file. Create a short animation and audio mashup using two songs with Staccato and Legato rhythms. Use Summertime and Another One Bites the Dust, if you wish or two songs of your own. The TWO songs you choose should demonstrate, very clearly, these two rhythms and snippets of each should blend together seamlessly. Animation should either start or end with your completed composition. Follow this tutorial for animating in Photoshop. We will do this together in class. If you haven’t already done so, import two pieces of music, one with staccato rhythm and one with legato rhythm: Summertime and Another One Bites the Dust. Download these files to your working folder or desktop – or use two of your own. Import your audio files into the audio tracks at the bottom of the timeline. Your audio will be much longer than the rest of your 10 second animation. You can drag and resize the audio layers to hear different parts of each song. If needed, adjust the work area to contain the animation in the Timeline panel. Additionally, you can adjust your animation to sync better with the audio. We will do this together in class, but you can review using this tutorial. Preview your animation and check the frame rate to make sure it’s 12 fps. 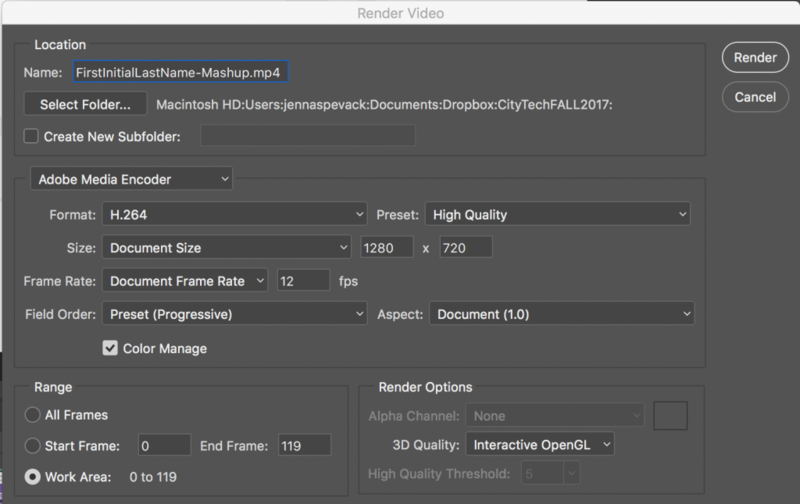 In the Render Video dialog box, enter a name for the video (firstinitiallastname-mashup). Choose Adobe Media Encoder from the menu below the Location section of the Render Video dialog box. Click Render. This will save an mp4 file to the folder you specified above. Save your all your file(s) to Dropbox or GDrive or flash for backup. Finally, upload your saved mp4 file to Dropbox or Google Drive and copy the link location. Follow the demo presented in class or refer to this tutorial for help. Create a new blog post called Sound Visualization Mashup: Phase 3. Add a link to your mashup animation (on GDrive or Dropbox). Write a short description of your animation. Don’t forget to comment on at least 3 other student’s posts. These should be full, thoughtful critiques of your peer’s good effort. Be thoughtful and helpful. If you have ideas about how the work can be improved, share them! Create a new blog post called Sound Visualization Mashup: Phase 4. NOTE: You will receive a grade and comments from the Professor on this post. Except where otherwise noted, content on site is licensed under a Creative Commons Attribution-NonCommercial-ShareAlike 4.0 International License.